Muddle the blueberries and thyme in a glass, add the rest of the ingredients then shake in ice and strain in to a cocktail glass. 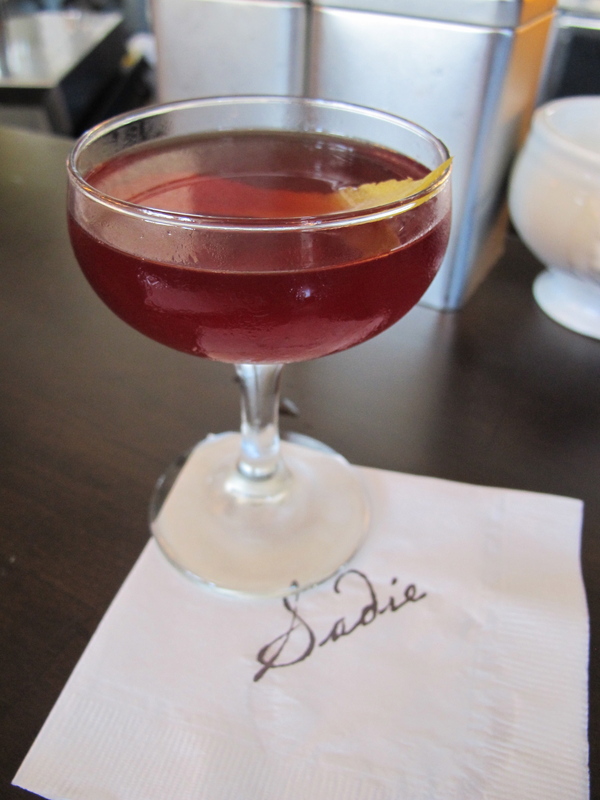 This drink was created by Greg Bryson, the new Beverage Director at Hostaria Del Piccolo in Santa Monica. I tried it last week and found it to be absolutely delicious and perfect for the summer. It is refreshing, sweet and has a gorgeous pink hue from the muddled blueberries. 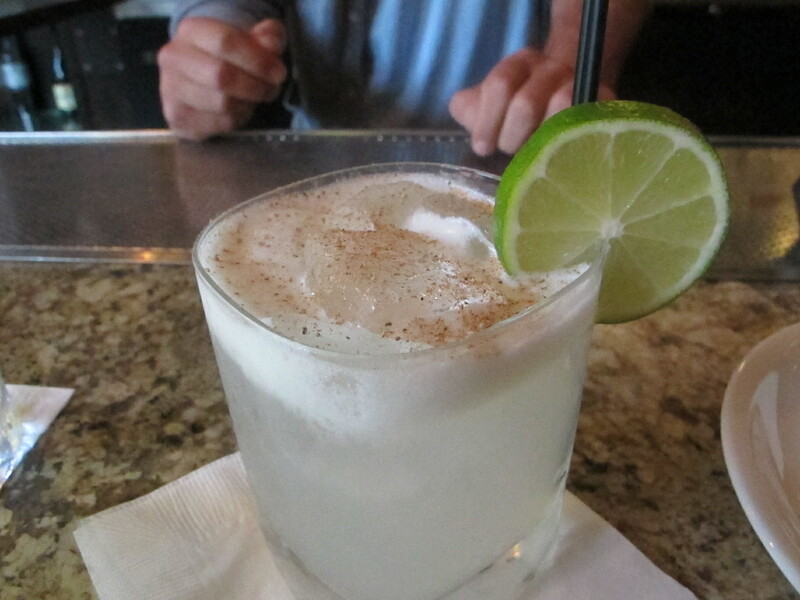 The thyme gives an interesting scent and flavor to the drink without overpowering it. I highly recommend heading in to Hostaria Del Piccolo (review coming soon) where you can get this and many other fresh ingredient concoctions on their new summer menu. On week days you can have it made by Greg himself. Enjoy! Rookie moves to avoid at Tales! 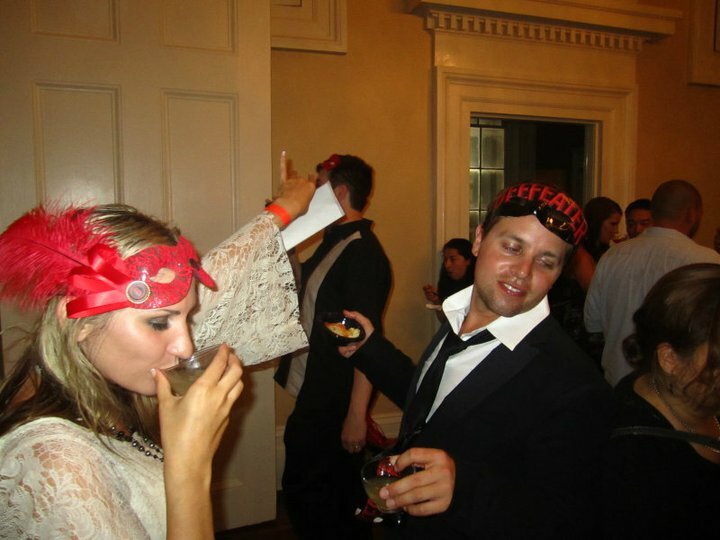 In 2011 my boyfriend FutureGreg and I went to Tales of the Cocktail (TOTC) in New Orleans, Louisiana. We had heard about it, read about it and finally decided to see it for ourselves. This has to be the best cocktail convention in the World. 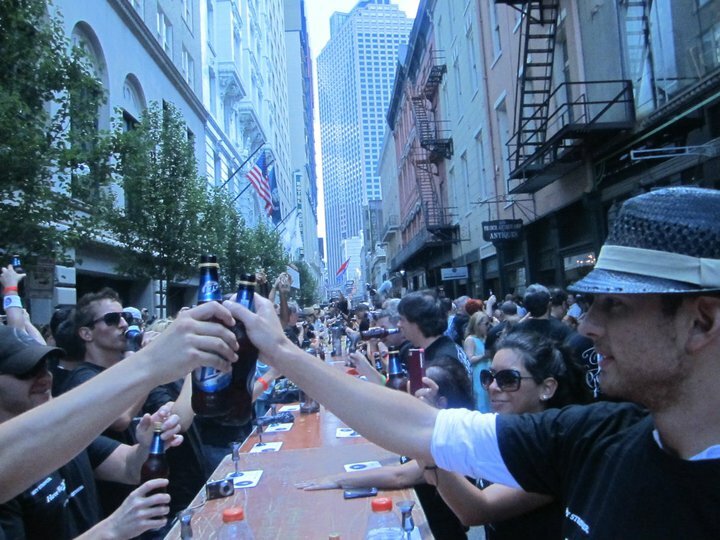 Thousands of the most influential and talented members of the cocktail community from all across the globe meet in the sticky heat of New Orleans and spend 5 days experiencing Tastings, Seminars, Parties and Competitions. Solution: Never finish the drink your holding! This is a big one, you’re going to be tasting some of the best spirits and cocktail/mixed drinks in the World. If you finished every drink offered, you would die. I’m serious. The number of full glasses I had to put down was so upsetting but a friend reminded me that I was supposed to be tasting the drinks also, so think of it as similar to a wine tasting. Obviously you can drink some of your favorites, but pace yourself. On our first visit we were wasted by 2pm on day one and struggled to get through the week…this year we know better. Solution: Get some sleep, if only for an hour. The events on offer are immense and run from 9am to 2am daily with a variety of after parties, after after parties and 5am meet ups at Absinthe house! You will often find yourself thinking ‘When the hell can I go to bed? !’ However take in to account that a lot of the events (especially tastings and seminars) are repeated throughout the week. Listen to your body, when you feel you need to crash, do it. Rookie Move: Who needs water, give me Gin. It is hot as hell in New Orleans during July so make sure you have a bottle of water or pedialyte close by to keep you refreshed. Coconut water was the beverage of choice last year. All the alcohol will dehydrate you, add that to the sticky heat and it creates a pretty dangerous environment for your body if you don’t take it seriously. Trust me, you’ll thank me later! Solution: For Gods sake, eat something! I don’t remember much of Tales 2011, and even less about the food. Some events will have snacks to nibble on but these aren’t exactly a meal so don’t rely on them alone. There are some great restaurants and places to grab a Po-boy or grits in New Orleans so make an effort to head there. The beignets at Cafe Du Monde are a definite must. We ate them daily! People always say ‘Don’t drink on an empty stomach’ so as you’ll be constantly drinking it makes sense that you should make time to go eat something decent. Rookie Move: 3am and your missing. Again. I can’t tell you how many times we lost people who stumbled off, particularly our friend Dane (pictured above). You may not be back in your hotel room very often, but try if you can to charge your phone between outings. 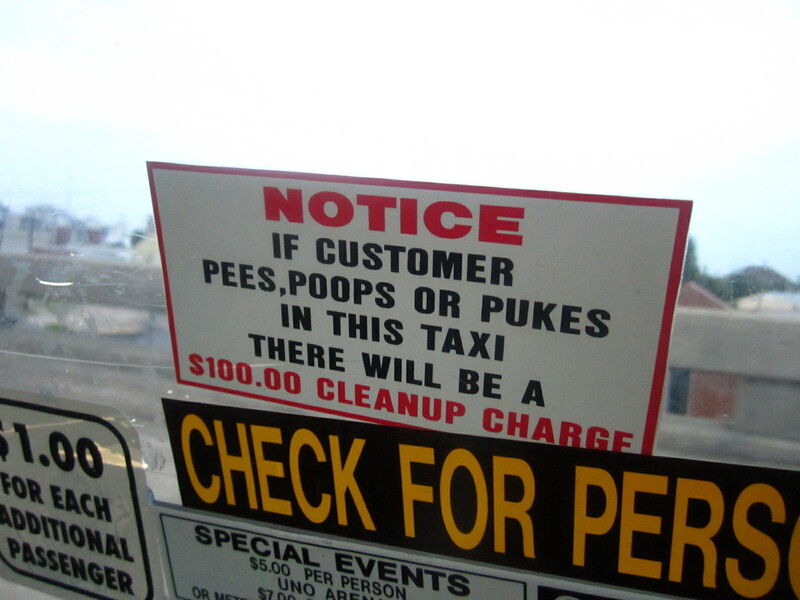 Yes the French Quarter is pretty safe, but this is still a big city and has big city dangers. You will meet lots of new people, exchange plenty of business cards but it’s always safe to be able to contact your friends (or the police!) so keep your phone charged and easily accessible. Having a means of contact will also mean you can find out about the next secret party location…there are several! Rookie Move: Do something crazy! Solution: What happens in Tales… Goes on Facebook! This isn’t Vegas, there are no ‘codes of conduct’ or rules of what can and cannot be written about. If you talk to a blogger/journalist be sure to say the words ‘Off the record’ when divulging company secrets! If I learnt anything about last year it’s that the photos taken (however terrible) end up on all the public forums. Bloggers, friends and work colleagues will happily tweet about your projectile vomit episode or instagram a snap of you with way too little clothing on, so be prepared for that to happen. 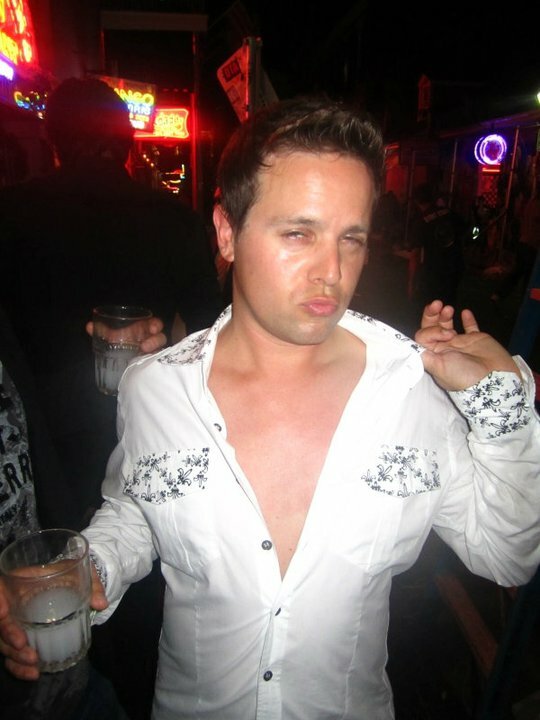 And if you’re the person taking the photos, try not to put the worst ones up…some of these men have wives back home!!! In all seriousness think before you do something you might regret and if you’re too drunk to think? Well, screw it. Don’t be mad at the person who found your behavior funny enough to post. Tales 2012 runs from 24th July to 29th July this year. FutureGreg and I will be there again, hopefully no longer making these classic rookie moves. 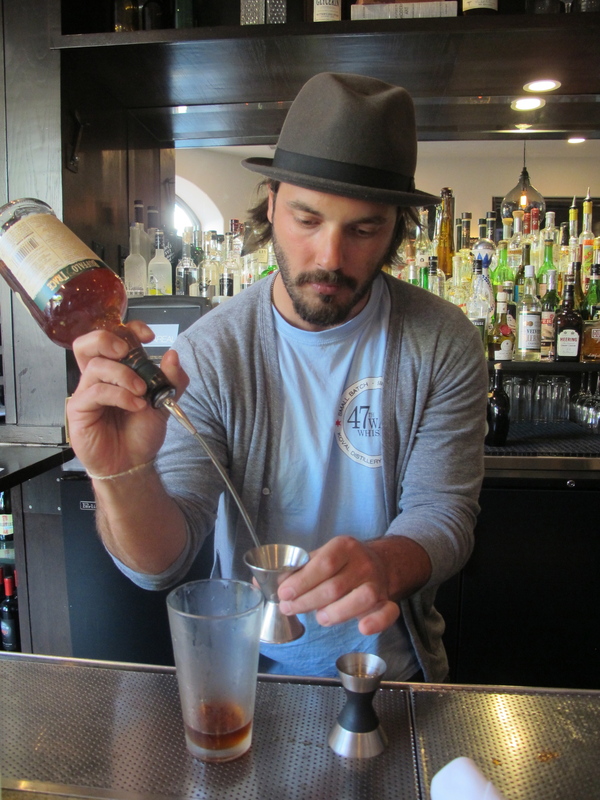 Just so you know, this year there are many great Los Angeles bars, bartenders and writers up for nomination. The LA bars nominated are Harvard & Stone, La Descarga, The Varnish and Spare Room. It’s a really great time to represent LA and I wish everyone the best of luck in their category. For those of you coming with us, see you in NOLA! 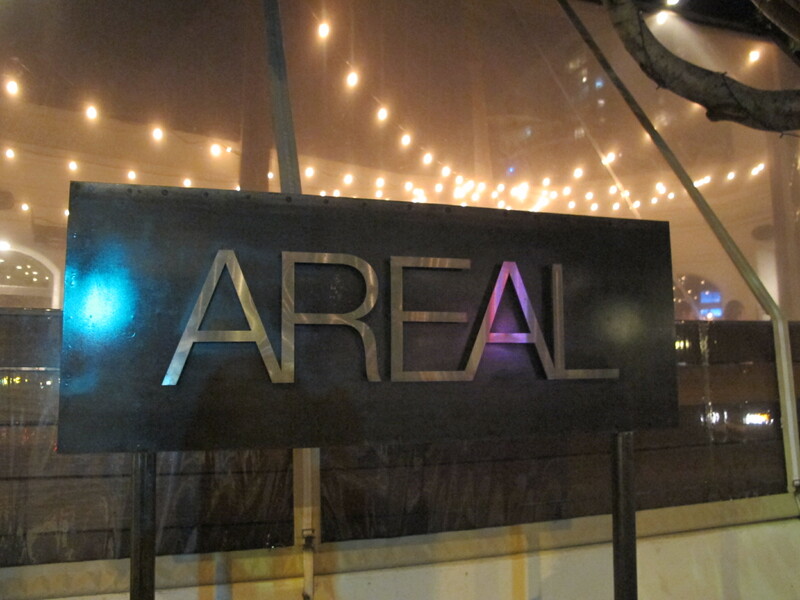 My boyfriend FutureGreg (FG) and I found ourselves at Areal in Santa Monica recently enjoying another of our Monday date nights. 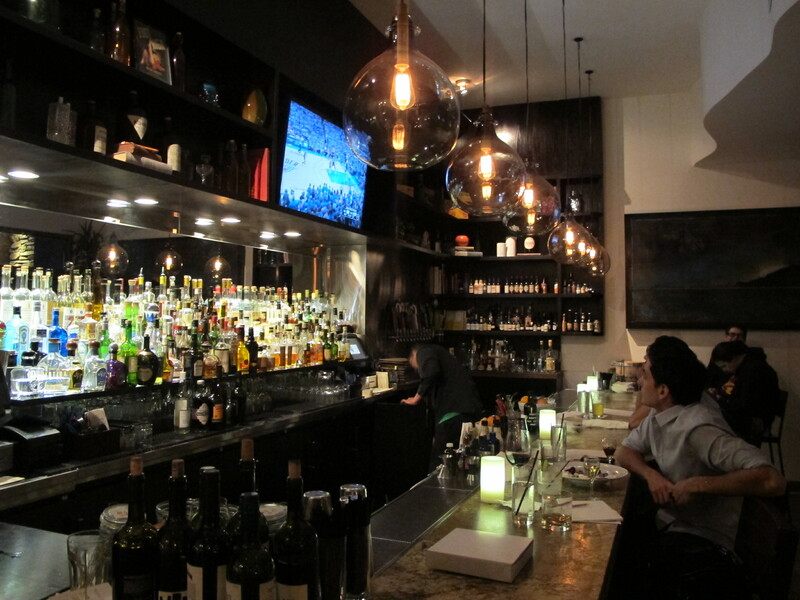 We sat at the bar, as per usual, and were fortunate enough to have our drinks made by their head barman Rich Andreoli. We arrived at the tail end of happy hour but managed to order a couple of bar bites and a daiquiri off the smaller happy hour menu before it ended. We started with the Vegetable risotto, it was creamy but not too rich and had a slight chicken stock flavor to it. The peas and asparagus were perfectly cooked, not too crunchy and not too soft. Next we had the beef tartar which had a nice light spiciness. The meat itself was soft, moist and had capers and onions mixed in. It came with hot toasted bread on the side which made a nice contrast with the cold beef. Both dishes were great options for the price. The Daiquiri was a nice simple classic, it was slightly sour for my tastes but FG enjoyed it and it was a bargain at $6. After the happy hour tasters we ordered off the main menu. We couldn’t decide between the steak or the shrimp pizza…so naturally, we got both! The 14oz Rib Eye with vegetables was a great choice, the dish reminded me of Sunday Roast dinners my mum would make back in England. All the vegetables were delicious, crunchy and full of flavor. Yes, you heard correctly, the Fussy One (who used to shy away from anything green on her plate) ate a whole plate of veggies… and enjoyed every one of them! There was Artichoke, Purple Cauliflower, Asparagus, Roast potatoes, Parsnips and Carrots…plus some caramelized garlic and shallot pieces that gave a delicious sweetness to the plate. It was very very good indeed. I had high hopes for the pizza we ordered, however sadly the menu didn’t mention it had chilies on so it was a little too spicy for me. The pizza base was delicious though, soft and crispy dough with powdered flour on the edges. I do enjoy a good pizza crust. Rich is a great bartender and gave wonderful suggestions for pairings with the food. He convinced me to try a large variety of drink options, so we sat at the bar and enjoyed many an alcoholic beverage. He chose me a great glass of wine to enjoy with the steak which was a nice change from the cocktails too. I’m not usually a red wine drinker but he gave me a glass of the medium bodied Mondave Cabernet which worked beautifully with the meat, it was fruity with just a hint of oak. The first mixed drink I ordered was the ‘Secretariat’. It was a nutty, very rich and sweet drink. It was a little too intense for me at the start of the meal but had a great combination of flavors. The pistachio honey really came through nicely, and worked well with the walnut liquor and bourbon. I didn’t really pick up on the lavender bitters because there were so many other overpowering flavors present. Certainly an interesting option, although i’d personally suggest it as an after dinner drink as opposed to with a meal. FG tried the ‘Single Village Fix’. He certainly enjoyed it, mainly due to the Mezcal, which has become one of his fast favorites recently. The drink itself had a fair amount of sweetness to it from the pineapple gomme (which is basically a syrup) but the smoky mezcal flavors were the most overpowering part of the drink and not really my style. The ‘Infante’ was the only drink that I honestly had no interest in trying because I’m not exactly a tequila fan but FG and Rich convinced me to give it a go at least. Of course, it turned out to be my favorite drink of the night. The tequila wasn’t overpowering at all and the rose water mist and nutmeg on top gave a great nose. It was balanced, refreshing and delicious! I highly recommend this drink. Dessert was just utter decadence. We were so full from food and cocktails that we boxed up half the pizza, but somehow Rich convinced us to try the ice cream sundae! This is definitely not correctly advertised, ice cream sundae sounds kind of boring when you see it on the menu…but if you knew how good it was you would get this in a heartbeat. 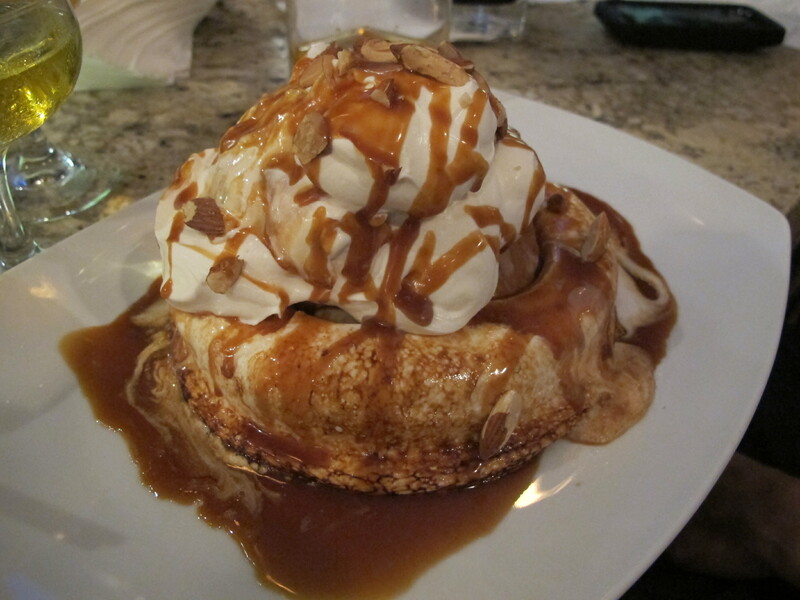 It’s a home made toasted marshmallow ring for the base, butter pecan, chocolate and vanilla ice cream in the center then topped with cream, nuts and bourbon caramel sauce. ARE YOU KIDDING ME?! This was beyond delicious, the marshmallow wasn’t overtly sweet and had a soft almost whipped texture to it. The ice cream was creamy, (butter pecan happens to be my favorite flavor) the bourbon caramel sauce wasn’t overpowering it just blended nicely with all the other ingredients and the toasted hazelnuts gave a nice texture. What a dish! Just when we were about to explode, the pastry chef brought us a Pavlova to try! She told us that she makes sure the house made meringues remain chewy, so we had to have a taste. Sadly the meringues on this occasion came out a little on the crunchy/dusty side…however the intension was there and i’m sure if we ordered it another time it would be as its intended. The whipped goat cheese was a great accompaniment to the berries on top. The food was a solid 3.5 before the dessert came out, but the ice cream sundae bumped it right up to 4 out of 5. If you can only order one item, get the sundae!!! The rest of the food was all very good as well, the risotto and Steak were my favorites and if it wasn’t for the chilies the pizza would have been excellent also. I’m giving the drinks at Areal 4 out of 5 also. All the cocktails were executed well, Rich was chatty and friendly and is a man who clearly knows his craft. I liked that he suggested things to try and asked me what spirits I prefer so he could make a drink accordingly, it made the whole experience more personal. I found some of the drinks sometimes aired a little on the sour side for my tastes, but seeing as I usually go for diabetic sweet they are probably fine for most people! I highly recommend this restaurant and i’m sure we’ll be back soon. The courtyard has fairy lights everywhere and looks beautiful. The whole restaurant has a romantic and attractive atmosphere, the bar is well stocked with lots of interesting bottles and liqueurs (some we’d never seen before) and the background music they play is great. Soft rock and chill songs by bands such as Oasis, Red Hot Chili peppers, Snow Patrol and Cold Play (all my favorites!). All in all a great night out. Shame about the $68 parking ticket that awaited us, we were having such a good time we forgot to feed the meter! Seeing as I started writing this piece while in the air en route to Washington DC this week (reviews of DC bars coming soon! ), I thought a fitting drink choice to put up would be the classic Aviation. The Aviation was created by Hugo Ensslin, the Head Bartender at the Hotel Wallick in New York, and first appears in his book ‘Recipes for Mixed Drinks’ in 1916. 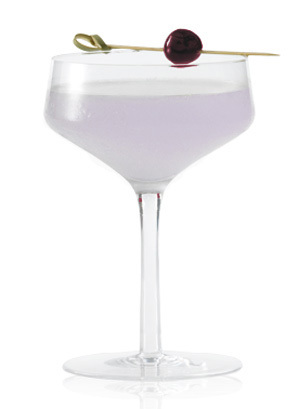 ‘The Savoy Cocktail Book’ by Harry Craddock printed in 1930 omitted the Crème de Violette, calling for a mixture of two-thirds dry gin, one-third lemon juice, and two dashes of maraschino. Just so you know, Crème Yvette and Crème de Violette are NOT the same thing. Crème Yvette is a sweet berry liqueur with a vanilla and honey taste, that has a hint of violet that can be used to give the drink its blue/light purple hue. Crème de Violette however is a violet liqueur, made with violet petals that give it a more floral flavor. It is the product listed in the original 1916 recipe. My boyfriend FutureGreg mentioned the use of Crème Yvette as an option which is why I put it in the above recipe, but by all means try both variations and let me know which you prefer! Aviation Gin is a particularly good choice to use due to its botanicals which work nicely with the other ingredients, also Ryan Magarian (Aviation Gins creator) actually named his product after the drink, because of how well it worked in the recipe. 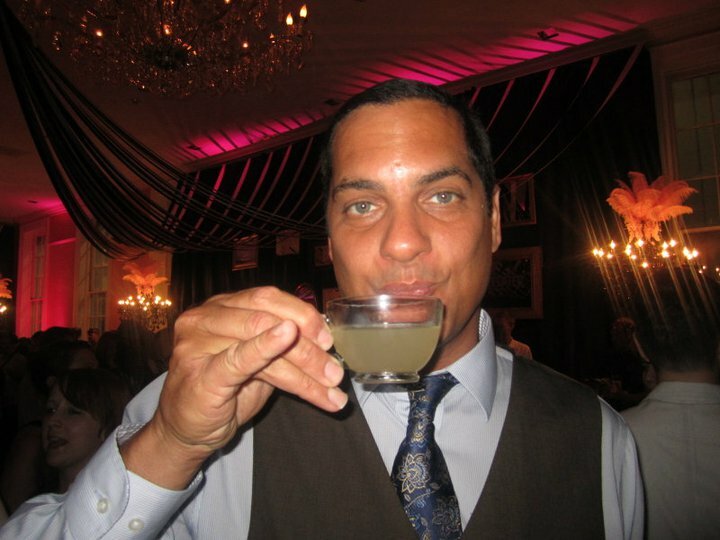 I’m going to end with a great video of Jason Bran making a cocktail on an airplane. I know it’s not an Aviation he’s making (it’s a Ramos Gin Fizz), but it’s certainly still in keeping with the flying theme and I thought it was so cool I had to share! Enjoy! Fill a pitcher 1/4 full with ice. Add a layer of the Tangerine slices (I prefer these to oranges as they are sweeter), a few lemon and apple slices, some mint leaves and a layer of the cucumber slices. Repeat the layering process until pitcher is full. Pour in the Pimm’s and Sprite or Ginger Ale. Mix ingredients together with a long-handled spoon. Divide drink among tall glasses, with a few slices of fruit and cucumber in each glass, along with some mint leaves. We just had the Queens Jubilee so it seems fitting to stick with a British theme for drink of the week. This is probably my favorite drink from back home. I used to make it for friends and I to drink out on the lawn at my house on the few hot days of our chilly British summers! It is an extremely refreshing, strong and easy to make beverage; great for enjoying by the pool, or on picnics whilst watching the cricket (in England of course). The fruit options can be changed based on what you have at home or what’s in season, the above is the recipe I used to make mine with but you can throw raspberries or strawberries in the mix too. It all seems to work well, and ends up as a delicious fruit cocktail. 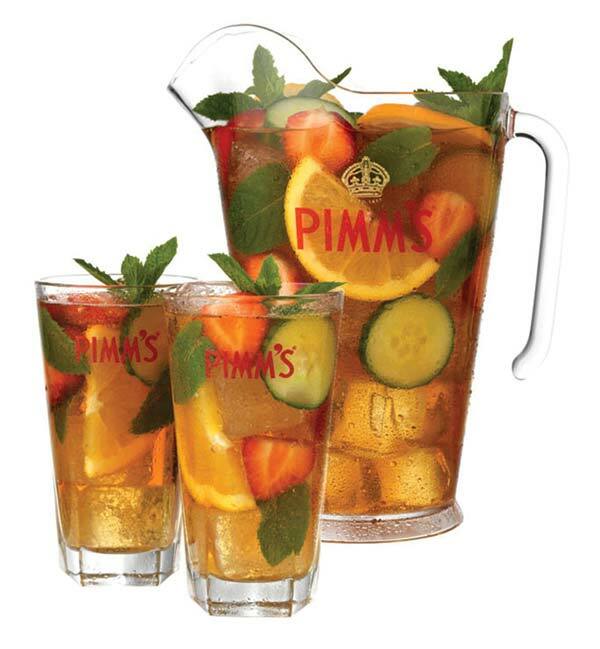 Pimms was first produced by James Pimm in 1823, an Englishman who became the owner of Oyster Bar in London, England. There are seven Pimm’s products, all of which are known as ‘fruit cups’ however only #1, #3 and #6 are still available. The essential difference between them is the base alcohol used to produce them. For the above recipe make sure you buy Pimms No 1 (it’s the most popular) because it has subtle spice and citrus flavors. It is a liquere based on gin and therefore works well with almost any fruits. Hopefully you will enjoy this British classic as much as I do. Perfect for the coming summer months!